VANS, the go-to skate wear culture brand, brought back their annual HOUSE OF VANS tour back to Seoul to experience the ultimate roundup of music, culture, arts, and sports. Add the BAD HANDS crew teaching the art of tattooing into the mix and it's the alley-oop to a kickflip (or some other skate culture lingo). HOUSE OF VANS (@houseofvans) was hosted at LAYER57 (@layer57), a cafe and studio space, and Common Ground (@commonground.1st), a pop-up shopping center; both of which are located in Seongsu. With the event hosted in other major cities like London, Hong Kong, and New York, Seoul made it their own by showing their best of the best creatives throughout the two-day event. Plastered along the walls of LAYERS57 were banners and posters displaying the quintessential logo and black and white checkered print to identify where the main programs were being held in the large studio space. A section on the side of the studio was appropriately titled The Street Market where many Korean artists and brands were able to host small booths to introduce who they are and showcase their crafts. SETERECORDS (@seterecords), THE QUIET LEAF (@thequietleaf_mag), and MISCHIEF (@mischiefmakers) were just a few brands to represent the skate and street culture in Seoul. In the main room of the studio, workshops, such as designing paper VANS shoes or learning how to create miniature toy version of the shoe were held throughout the duration of the event. One of the headlining activities was hosted by BAD HANDS (@badhandstattoo) which taught visitors who were interested the craft of tattooing. 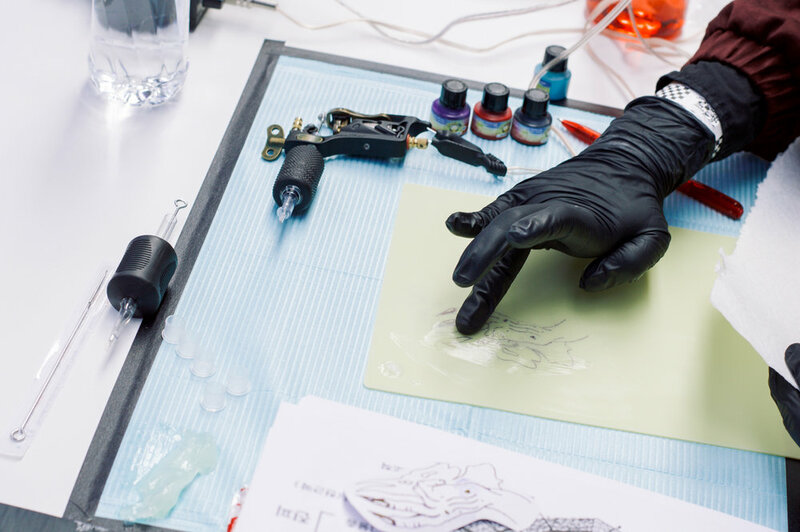 BAD HANDS, a tattooing crew currently comprised of sixteen artists, has been leading this workshop since the last HOUSE OF VANS event in 2016. One of their head artists, CHONO (조천호), explained that they can see how the tattoo culture has been picking up over the past few years. In a country so immersed in a Confucian-like culture, where adding any unnatural modifications is looked down upon, it seems that the influences from abroad has caused a positive chain reaction to the growing tattoo scene today. 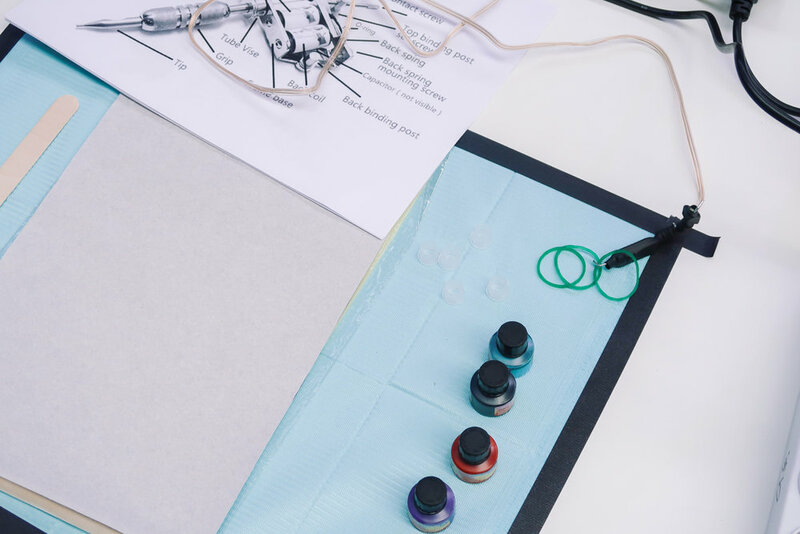 The workshop allowed each student who had registered full access to a complete tattoo set which comprised of the inks, needles, and fake skin. The class first started with a bit of the tattoo history present in Korea then soon moved onto the technical aspects of tattooing, like the diameters of different needles and other equipment used. Students were give the option to use an original image designed by BAD HANDS tattoo artists or to use an image of their choosing. Step by step instructions were given on how to trace the image onto transferable ink to create a stencil for the tattoo. To transfer the stencil, the students needed to apply petroleum jelly onto their fake skin before they could press down the image onto the skin. Once they all got their image onto the thin layer of fake skin, the whirring and buzzing of the needle could distinctly be heard. After a couple millimeters of outlining the image, the students were taught to take a wet paper towel and wipe the excess ink off to not cause any stains on the skin. It took a bit of getting used to and a lot of concentration, but it was obvious that each student came out of the workshop with a lot of respect and whole new outlook for tattoo artists and their craft. JAE KWON SHIM (@nudeblack) has tattoos personally and was introduced to this event by his girlfriend. He doesn’t have any plans to become a tattooist himself, but if the opportunity presented itself, he says that he would want to try. SO JEONG LEE (@supergood_lee) explains that her personal tattooing experience compelled her to see what it was like on the other side of the needle. The process of tattooing was a lot more difficult that she expected, but still really enjoy the workshop. As much as skate culture is a growing scene in Korea, the tattoo culture is just as much so. The negative stigma of tattoos can be slowly diminished with the introductions of workshops like this one provided by BAD HANDS and VANS. It’s exciting to see what the next year hold for HOUSE OF VANS in Seoul.